kay bojesen: santa claus. danish made; imported from denmark. special: $99.99 instead of $149.99. santa claus wooden figurine is a scandinavian christmas decoration classic. kay bojesen's santa claus in lacquered beech wood. the beloved wooden figures of danish toymaker kay bojesen welcome to their family this paragon of playfulness: father christmas. kay bojesen's jolly santa is carved from beech and vibrantly painted to convey the festive spirit of christmas. this poseable figure carries a walking stick and a burlap sack of toys for well-behaved children the world over. this classic santa claus figure comes packed in a beautiful gift box. 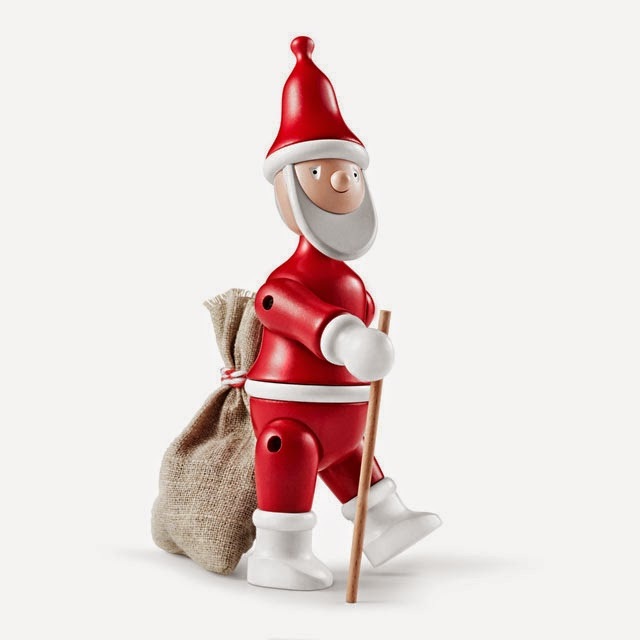 the kay bojesen santa claus was designed by danish designer kay bojesen in the early 1950s. with his grey beard and plump belly, santa claus peek out from under his red hat with a cheerful sparkle in his eye, while his hands grasp a walking stick and bag.